Several years ago, I used to wait tables at a sushi bar. Every once in a while, the chef would allow me into the kitchen when he needed an extra hand with prep work, which usually involved holding a fine mesh screen over a bowl while he extruded something through it, or locating an item for him in the freezer. Although these tasks were mundane, I still loved being in the kitchen during that time of day when it was still quiet and serene, and before that atmosphere was transformed into a symphony of clanging pots, endless puffs of steam and hands moving quickly to produce plate after plate of Japanese dishes.One day, during prep in the early afternoon, the chef was assembling gyozas, and asked if I wanted to try to make one. As I picked up one of the dumplings, he showed me how to fold it, and how to make the crimping along the edges, pinching them at exact intervals on each side so they looked perfect. Assembling these gyozas this past weekend brought back that nice memory of sitting with him briefly in the kitchen that day while it was still quiet, making pretty things together for others to taste and enjoy. Chop the sweet potato into small, dice-sized pieces. Bring plenty of water to boil in a medium-sized pot, add the potatoes, salt and a bit of oil and boil, uncovered, for 12-15 minutes. Drain, mash and set aside. In a small saucepan, saute the lemongrass hearts and shallots in the peanut oil for 3-4 minutes over medium heat. Transfer to the sweet potato mash and combine well. Add in the peanuts and chopped cilantro and allow to cool for about 10 minutes. To assemble the gyozas, lay one wonton skin on a flat surface. Dip your finger into the flax seed/milk mixture and run it along both ends of the wrapper to help create a seal. Then place 1 tsp of the sweet potato mixture into the center of the wrapper. Fold the wonton into a triangle shape and run your finger along both edges to seal it. Then, pinch the edges together to create a crimped shape along the edges. Lay the assembled gyoza on a slightly oiled cookie sheet while you prepare the rest of the gyozas. Once they are all assembled, heat some oil in a medium-sized frying pan over medium-high heat. Let the pan heat up very well, about 4-5 minutes. Gently place the gyoza in a single layer in the pan, taking care to watch for any oil splashes. Let them sit in the pan for 3-4 minutes, or until well-browned on one side. Take 1/4 cup water and slowly pour it into the pan. It will violently sizzle. Cover immediately, and reduce the heat to low. Allow it to steam for an additional 5-7 minutes. Transfer back onto the cookie sheet to cool, and repeat the process until all of the gyozas have been cooked through. To make the sauce, whisk together all of the sauce ingredients. These can be served warm, room temperature or cold. It so fun to learn about other food cultures. You are lucky to know more about japanese cuisine. I love your recipe it looks super delicious! i am a dumpling fan, steamed or fried. i like the versatility of this recipe because you can use any veg that is in season. Love gyozas. Like tiny dumpling crack. What a great experience for you! Man, I am kind of regretting choosing to wait tables at Red Robin now. So not as cool 🙂 But these gyozas are gorgeous and I love how you are so good at choosing flavor combinations! What a lovely combination of flavors! Gyoza’s are something I’ve never attempted before, although I do love to eat them. Yum! Your blog is so fantastic, I absolutely love your recipes and am so inspired to make as many of them as I can! Variation is definitely the key to a rich vegan lifestyle. 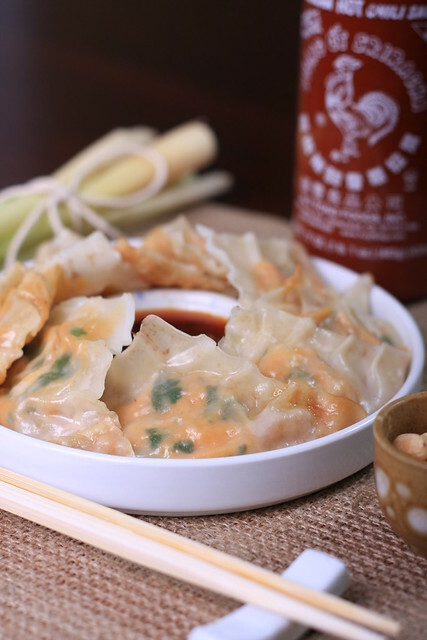 Gyozas are so yummy…this recipe is incredibly simple, which means I might have to make my own! I have a question: can you substitute flax seed/flax seed milk with something else as a sealant? Maybe try a little flour mixed with water? It may form a slight paste which will bind to the wrappers. Just a guess, though? Good luck! I just made these tonight with a little twist. In Okinawa, there are no orange sweet potatoes. There is only the native purple sweet potato known as "benimo." It is delicious in its own right, but would not have been a good fit for this recipe. I instead used kabocha squash and replaced the peanuts with ground cashews as that is what I had on hand. I also added 2 Tb. of coconut cream and a little lemon zest & scallion in place of lemongrass which was not on hand. I also added a little sesame oil to the sauce. I left the raviolis toasted because I like that texture as a kind of tapa/finger-food. I put the sauce in the middle as you did, and then laid the raviolis on top of a bed of fresh baby spinach. Delicious. I love that your recipes are not only award-winning on their own in taste–but are easily adaptable if specified ingredients are not on hand. Leila, I had no idea that there were no orange sweet potatoes in Okinawa — I wonder why? I love what you did with the ingredients and flavors, and you gyozas sound delicious! These are gorgeous! I love hearing about new ingredients, thanks for sharing! Oh my gawd, these look amazing!